The City of Newark has had its trouble with water fountains. Two years ago, positive lead tests forced Newark to temporarily shut down fountains inside 30 public schools. But when it comes to outdoor drinking fountains, there is a much different problem: most of them are broken. The I-Team took a census of 35 outdoor water fountains in Newark’s public parks and playgrounds. Some of the fountains are owned and maintained by the City of Newark. Others are owned and maintained by Essex County. In all, only 11 of the fountains produce water when you press the button. In other words, more than two-thirds of the outdoor fountains tested by the I-Team don’t work. Spokespersons for Newark Mayor Ras Baraka declined to answer questions about the broken water fountains. Daniel Salvante, director of Essex County Parks, blamed some of the faulty fountains on old-age and others, he said, were victims of intentional damage. “We have some issues that we deal with on a daily basis. One is vandalism, unfortunately,” Salvante said. He also suggested the public’s appetite for water flowing out of public fountains has waned. But in recent years, environmentalists and park advocates have pushed back against the widespread use of bottled water. “If you drink from the water fountain you’re not creating waste that goes to the landfill in a plastic bottle. You’re not spending money unnecessarily. Or you’re not tempted to buy a high calorie drink,” said Adrian Benepe, a former NYC Parks Commissioner who now serves as senior vice president of The Trust for Public Land, a nonprofit focused on creating and preserving park land. Some parkgoers told the I-Team they avoid Newark’s public water fountains partly because of concerns about lead. Precious Williams, a runner who regularly works out at West Side Park, said the lead scandal in Newark public schools has made her skeptical about other water fountains. Asked if she would utilize a fountain right next to the running track, she shook her head. “I probably wouldn’t, unless they were tested for lead,” Williams said. Indeed, the I-Team's census of Newark’s outdoor fountains began as an effort to test for lead in the water at public parks. 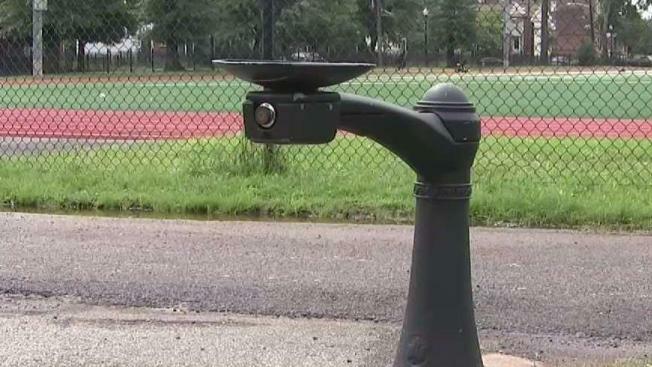 After a spokesman for Mayor Ras Baraka said the city does not test for lead in outdoor fountains, the I-Team hired a certified water quality testing company to analyze water samples and look for toxins. But along the way -- exploring and gathering water samples in parks across the city -- it became apparent that most of the water fountains were non-functional. Salvante said the Essex County Parks Department would review the list of broken fountains provided by the I-Team and determine which ones should be repaired and which ones might be decommissioned. The results of the water samples that were taken are promising. Only one outdoor fountain exhibited any trace of lead, and that sample was just 0.01 parts per million – far below the EPA threshold of 15 parts per million. Despite the generally positive results, it is worth noting that testing outdoor drinking fountains has limits. Experts say the most accurate lead tests involve drawing water from a fountain at least six hours after the fountain was last used. But in outdoor settings, it is impossible to block members of the public from using fountains, and thus confounding the results.